FRANKLIN, Mass. – When the season began for Franklin, expectations were limited for a young roster that was hoping to earn enough wins just to get into the postseason. The younger players developed quicker than even Franklin coach Kate Horsmann could have hoped and not only did the Panthers reach the tournament but on Thursday night hosted Shepherd Hill in the Div. 1 Central/West first round. Franklin continued its strong season with a 3-1 (25-22, 20-25, 25-16, 25-17) victory over the Rams and advanced to the sectional quarterfinal for a trip to third-seed Lincoln-Sudbury. The Panthers looked like a young team in the early moments of the opening set, trailing 9-7 and struggling to get into a rhythm, but Franklin turned it around with a 12-2 run, including a 5-0 run with sophomore Maggie Doyle serving a pair of aces. Meaghan Maguire added a pair of kills and Lindsay McGowan had two others to help the Panthers build a cushion. Shepherd Hill fought back with a 10-2 run of its own to tie the first set at 21-21, but Franklin was able to close it out with kills by Doyle and senior Erin Skidmore and errant shots by the Rams. The momentum of the first set did not carry over to the second. Franklin struggled to get going again, but could not mount the same comeback that carried it to the one-set lead. The Panthers had five service errors in the set and trailed by as much as 18-9. Although Franklin cut the lead to 23-20, a pair of errors gave the Rams the set. Just as the positive momentum did not carry over from the first, the struggles of the second did not carry over to the third. 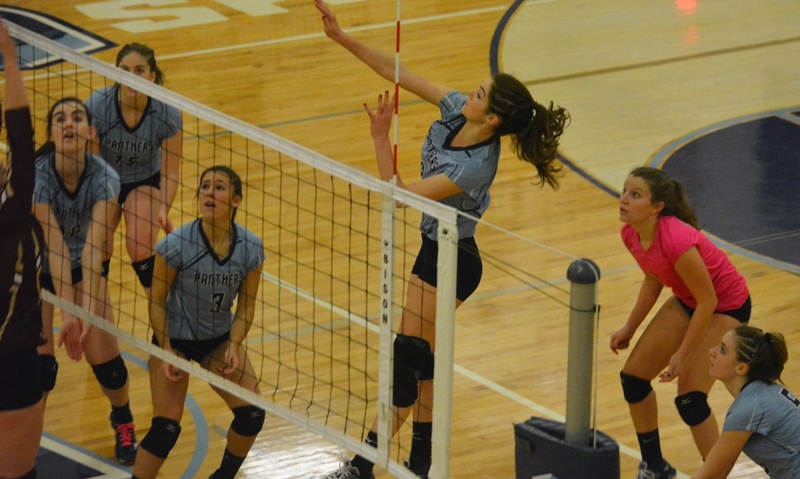 Franklin found its serving touch with senior libero Maddy Kuzio, sophomore setter Lauren McGrath, and sophomore Riley Marino all recording aces. Horsmann admitted that she could not take credit for the turnaround from the service line from set to the next. The work on the practice court paid off for Maguire and Doyle, who emerged in the third set to be Franklin’s primary weapon. The middle hitters regularly found room to hit around the Shepherd Hill block and were also a strong presence defensively at the net. Each had three kills in the third and then combined for another five in the decisive fourth set. The third set was closed out by Skidmore, who rose up to smack a kill inside the end line. She had three kills in the set and finished with a team-high nine for the match. In addition, the senior hitter added several strong digs, aces, and leadership on the court. The fourth set was a dominating stretch for the Panthers, who jumped out to an 11-4 lead and never looked back. Junior hitter Lauren Lockhart came off the bench and had several important swings in the final two sets, including a shot down the line off a scramble, catching Shepherd Hill in transition and ending a mini-Rams run. The Panthers did not know coming into the season that they would be a playoff team and Horsmann knows that this run will be a strong building block for the future. Franklin (13-6), the No. 6 seed, will take on third-seeded Lincoln-Sudbury on Monday at 7:00 p.m.